Our Abpromise guarantee covers the use of ab50411 in the following tested applications. WB Use a concentration of 0.1 - 0.3 µg/ml. Detects a band of approximately 60 kDa (predicted molecular weight: 55 kDa). IHC-P Use a concentration of 3 - 6 µg/ml. DNA- and RNA binding protein, involved in several nuclear processes. Binds the conventional octamer sequence in double stranded DNA. Also binds single-stranded DNA and RNA at a site independent of the duplex site (By similarity). Involved in pre-mRNA splicing, probably as an heterodimer with SFPQ. Interacts with U5 snRNA, probably by binding to a purine-rich sequence located on the 3' side of U5 snRNA stem 1b. The SFPQ-NONO heteromer associated with MATR3 may play a role in nuclear retention of defective RNAs. The SFPQ-NONO heteromer may be involved in DNA unwinding by modulating the function of topoisomerase I/TOP1. The SFPQ-NONO heteromer may be involved in DNA nonhomologous end joining (NHEJ) required for double-strand break repair and V(D)J recombination and may stabilize paired DNA ends. In vitro, the complex strongly stimulates DNA end joining, binds directly to the DNA substrates and cooperates with the Ku70/G22P1-Ku80/XRCC5 (Ku) dimer to establish a functional preligation complex. Nono is involved in transcriptional regulation. The SFPQ-NONO-NR5A1 complex binds to the CYP17 promoter and regulates basal and cAMP-dependent transcriptional avtivity. NONO binds to an enhancer element in long terminal repeats of endogenous intracisternal A particles (IAPs) and activates transcription. Heart, brain, placenta, lung, liver, skeletal muscle, kidney and pancreas. Also found in a number of breast tumor cell lines. Note=A chromosomal aberration involving NONO may be a cause of papillary renal cell carcinoma (PRCC). Translocation t(X;X)(p11.2;q13.1) with TFE3. Contains 2 RRM (RNA recognition motif) domains. 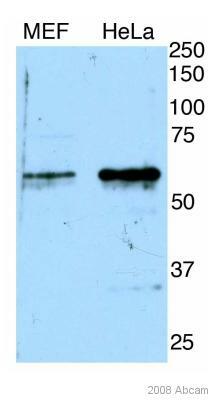 Anti-nmt55 / p54nrb antibody (ab50411) at 0.1 µg/ml + Mouse Brain lysate (35µg protein in RIPA buffer). Primary incubation was 1 hour. Detected by chemiluminescence. Lysates/proteins at 50 µg per lane. This image was submitted courtesy of an Abreview, please refer to Abreview for further experimental details. ab50411 at 3.8 µg/ml staining nmt55 / p54nrb in Human spleen by Immunohistochemistry (Formalin/PFA-fixed paraffin-embedded sections). Steamed antigen retrieval with citrate buffer pH 6 was performed. Antibody was revealed with AP-staining. Publishing research using ab50411? Please let us know so that we can cite the reference in this datasheet.